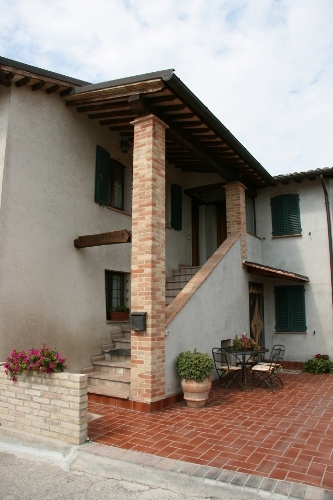 Located in the centre of a small and pleasant country village, our farmhouse offers a unique Umbrian bed and breakfast experience. All bedrooms are fully equipped with air conditioning and heating. In the morning we will offer you a typical Umbrian breakfast, with ingredients freshly produced from our farm. There is plenty of parking available and a pleasant garden in which you can relax and soak up, the quiet and atmosphere of the countryside. Casale is well-positioned in the centre of Umbria within easy access to the principal towns and touristic spots, such as, Foligno, Spoleto, Assisi, Todi and Perugia. From here you can easily reach Rome and Florence in about two hours by car or by train It is also within walking distance from the village of Montefalco, famous for its sagrantino wine and known as 'the balcony of Umbria', because of its views.